Papaya facts, an information sheet for kids cooking activities. 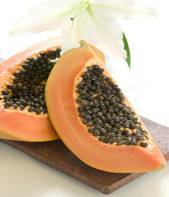 Papaya facts and general information about papayas. On a tree in warm tropical areas. Papaya should yield slightly when pressed. They have a smooth skin and should be mostly yellow. You can buy a little greener and ripen at home. Store at room temperature if papaya needs to ripen. If ripe, it can be stored in the fridge. Slice in half and scoop out seeds. Chop and use in salads, salsas, main dishes or eat as is. Papaya aid in digestion. They contain Vitamin C, folate, potassium, fiber, Vitamin A and lycopene. Mix fruit and onion together. Pour lime juice over top and stir in cilantro. You can add hot peppers if desired. Chill for 1 hour. Mix together cream cheese and marmalade. Spread mixture over a ham slice and top with a piece of papaya. Secure with a toothpick. Chill until ready to serve. Back to Food Facts page from Papaya Facts.